1) Non-ablative Laser Rejuvenation (NALR-1320nm) using carbon peel for skin rejuvenation. 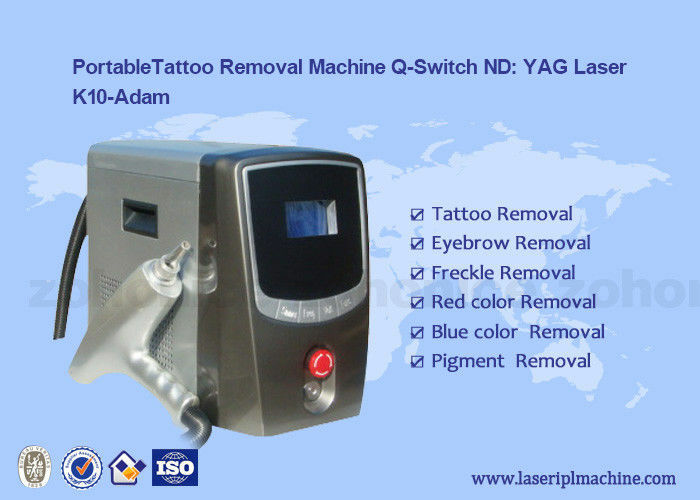 3)1064nm: for treatment of tattoo removal, dermal pigmentation and treating certain pigmentary conditions such as Nevus of Ota and Hori’s Nevus. (mainly for black and blue pigmentation). 1.Easy to operate,quick to be cured. 2.No bleeding, narcotization is not necessary. 3.High and new laser technology-instantaneous explosion. 4.LCD display in both Chinese and English, IR remote control. 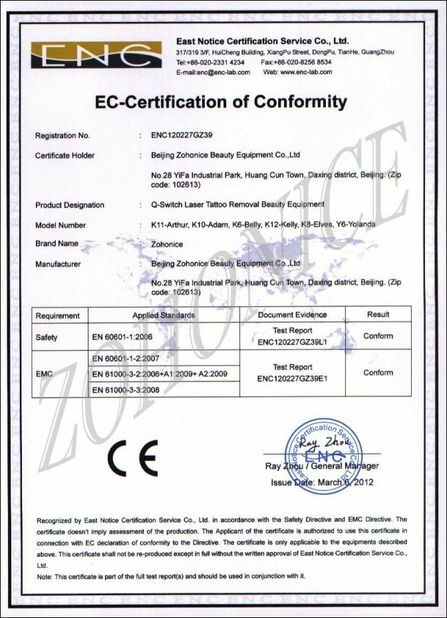 5.Standardized building block design, convenient in maintenance. 6.Will not destroy hair follicle, will not injure ordinary skin and scarless. 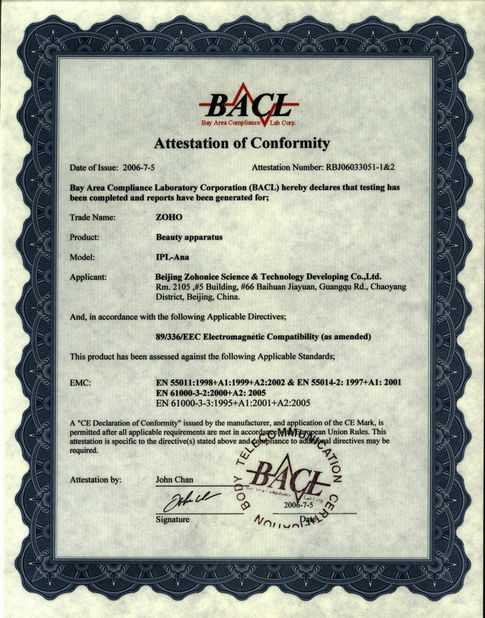 7.Solid laser, produced according to international standard, stable in property. K10- Adam makes use of the explosion effect of laser, which can permeate the cuticle efficiently to the pigment mass in the derma. The laser pulses in nanosecond range with very high energy. When the laser is absorbed by according pigment, the pigment mass expands quickly and breaks into particles which are eliminated through phagocytes. Whereby the shattered pigment is absorbed by the body and excreted out. Gradually the pigment becomes lighter and lighter till disappearing. The working time should be controlled less than 40 minute every time and then stop for 20 minutes. 1. No stimulating effect of the use of whitening products. 2. within seven days does not wash with hot water, not sauna. 4. bleeding at Miaomei ban, do not touch the water infection. 5. If crusting not use the clutch. 6. In the lesion site can be applied erythromycin ointment or aloe beneficial to the skin repair cream. 7. The more bleeding, swelling, severe cases can be oral anti-inflammatory drugs, or prescribed medication. Q.: How many treatment heads are the machine with? A: One handle, three treatment heads:1064nm, 532nm and black doll. Q. Does the machine can remove pigment spotS? A: Yes. it can removal all kinds of pigment spots, such as freckles ,age spots. Q: Does the machine can remove nevus of Ota? A: Sure. 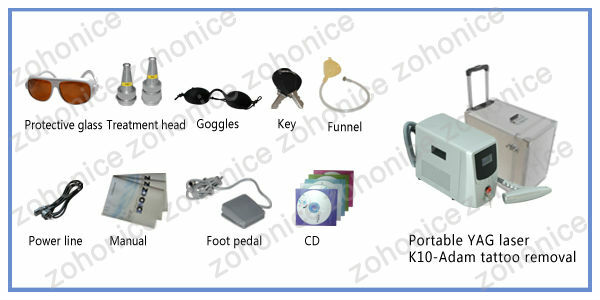 It can effectively remove nevus of Ota with 1064nm treatment head. Q: What ‘s the function of black doll head? Q: What colors tattoo does 1064nm remove? A: Black tattoo, brown tattoo, dark blue tattoo. Q: What’s the pulse rate of this machine ? A: Pulse rate is 1-6Hz adjustable. It's helpful to depth treatment.